Personalization is an activity that many people enjoy because it makes an ordinary item special. It is a simple way to mark an object as yours in a creative and fun way. You can personalize things for yourself or you can do it for friends and family as gifts. You can have all types of items personalized, like mugs, clothes, umbrellas, backpacks, and more. If you’re looking for a new personalization idea, you can also create personalized blankets! It would be a hard search to find someone who wouldn’t love personalized blankets. Blankets come in all different colors, cuts, and materials so there’s a perfect blanket out there for everyone. At AMBRO Manufacturing, we have tons of options for your personalized blankets. We can offer you custom embroidery on your blankets for team logos, special dates, monogramming, and sew-on patches. If you want screen printing on your personalized blankets, we can do that too! 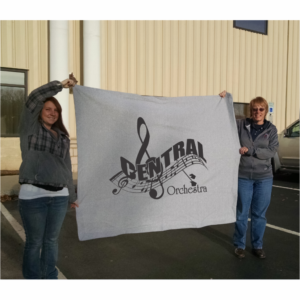 Not all printing companies have the capacity to take on oversized printing for blankets, but we sure do. We’ve got the necessary equipment and the extensive experience it takes to pull off top quality oversized printing. Here at AMBRO Manufacturing, you can go as big as 38” by 38” with your artwork which is gigantic! This size print would be perfect for personalized stadium blankets because your favorite team is sure to see you in the stands. And don’t be shy if you’ve never had blankets personalized before because we can help you out with that. Our support team is always here to answer any questions you might have and to guide you through the process until you reach your custom blankets! If you are interested in getting some personalized blankets of your own, you can contact us by email or by calling us at (908) 806-8337.